Located close to Sagamihara station, approx. 40 min. 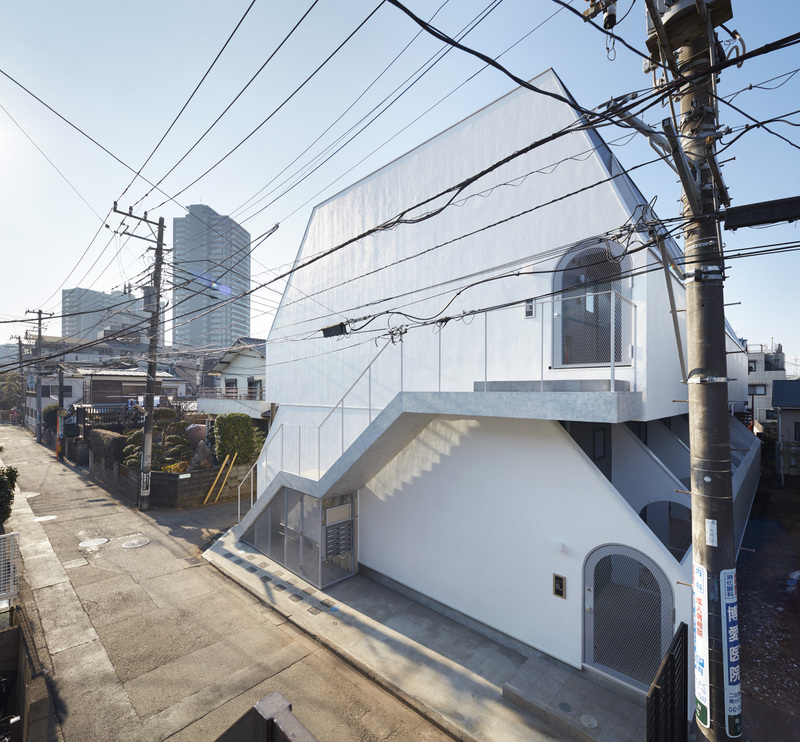 from central Tokyo, “TRAYS”, a two-story apartment of 12 residential units stands in suburb residential area mixed with large apartment complexes and detached houses. Being designed within the framework of two-story wooden apartment building in architectural regulations, “TRAYS” materializes a quality comfort of privacy and space in living by introducing the concept of “TRAY”, a residential unit complete with dwelling unit, balcony, and porch as a detached house. “TRAY”s are stacked on top and aligned to form an apartment building. “TRAYS” is built on maximum building coverage ratio as well as setback-line limit, utilizing the maximum volume allowed within the building condition of the premises. Porch, sandwiched between walls with arch shape opening, is a space in front of the door where tenants can put their bikes which also serves as corridor in continuation with “TRAY”s. Tenants need to go through the porches of other tenants to go outside the apartment, leaving ambiguity of the privacy of porch. With the limited number of tenants, 6 in each floor, we considered sharing porches is within the acceptable range. Glass wall facing the porch gives visible access to and from the interior, which can be adjusted with blinds. Interior of “TRAY” is finished in white, partitioned by grey wall to segment porch, dwelling unit, and balcony. All residential units have lofts and high ceiling, making the maximum height of the two-story apartment almost 10 m. In proportion to the height of the apartment, outer walls of “TRAY”s are also high to secure the privacy from outside while diagonally cut walls in the balcony and porch allow intake of light and wind, defining unique form of the building. As two-way evacuation route is not required by Building Standards Act, there is no evacuation route between the balconies, which contributes to the privacy of the balconies. The only openings in the balcony are glass wall, doors and window to the dwelling unit, and the balcony can be utilized as part of the dwelling unit. The building condition of the premises allows three-story reinforced concrete apartment building, however two-story wooden apartment was chosen in consideration of rent balance. Being categorized as two-story wooden apartment with loft in building regulation, this apartment was designed as quasi-maisonette with better access to loft space which is spacious and habitable.